I am an artist and maker living in Scarborough, North Yorkshire. 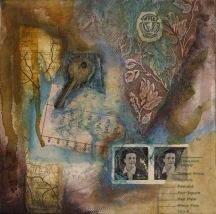 My work is predominantly mixed media based - I create collages, paintings and assemblages incorporating found objects and ephemera. I work from my little studio at home on the North side of town, with views of the sea and Scarborough Castle. I am available to undertake commissions, participate in exhibitions and some pieces of work are available to purchase. Please do have a look around my website and if you want to get in touch, you can use the contact page. Thank you for visiting.